This, the sequel to the best-selling novel, Spartacus: the Gladiator, takes up the story where the first book ended. The mighty slave army, led by Spartacus, has carried all before it, scattering the legions of Rome. Three praetors, two consuls and one proconsul have been defeated. Spartacus seems invincible as he marches towards the Alps and freedom. But storm clouds are massing on the horizon. Crixus the Gaul has defected, taking all his men with him. Crassus, the richest man in Rome, begins to raise a formidable army, tasked specifically with the defeat of Spartacus. And within the slave army itself, there are further murmurings of dissent and rebellion. Spartacus, on the brink of glory, must make a crucial decision – to go forward over the Alps to freedom, or back to face the might of Rome and try to break its stranglehold on power forever. Do you know wane they make a translate of this book to Dutch? I read the first one in 3 days and I’m waiting now first rebellion to come out in Dutch. @Jurre: Greets, and thanks for your message. I don’t know when Rebellion will be out in Dutch – but I imagine that it won’t be long – my Dutch publishers usually bring out the next one only about 6 months after the last. Dank u wel! Ben. Do you know when there will be also in italian language chapter 2 of Spartacus saga. I mean “Spartacus: rebellion”? I’ve finished yesterday to read the first one….BEAUTIFUL!!!!!! …I’d like also to ask if it’s planned the traslation of Annibal saga. The italian editor may be “Piemme”. @devis: Grazie for your message. I am sorry to say that I don’t know when the second part will be out in Italian. Foreign publishers never really tell me these things. If you contact Piemme, they will be able to tell you. At this moment, Piemme have not bought Annibal – but I hope that they will! Ciao – Ben. I have the same question as Jurre. 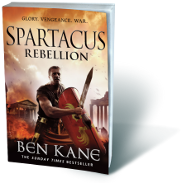 Where and when can i buy the DUTCH paperback version from Spartacus ‘Rebellion’. @korrel: Thanks for your message – I am delighted that you liked the first Spartacus book so much! I don’t know when the second one comes out in Dutch – but it won’t be that long. I will try to find out and get back to you. Happy New Year! Ben. Hace 5 minutos acabo de terminar esta primera parte de uno de mis personajes históricos favoritos, no puedo esperar a que la segunda parte este a la venta…or even if I can buy it on English, I won’t wait to have it. Muchas, muchas gracias por esta increíble historia. @Cristian B: Hola, y gracias por tu mensaje. Estoy feliz oyer tu has disfrutado Espartaco Uno. La segunda parte saldra en junio, creo. Saludos. Buenas noches desde Madrid Ben. En primer lugar quisiera felicitarle por la extraordinaria trilogía de Camino a Roma, me pareció muy buena. Después de esperar para empezar a leer Espartaco he visto por aquí que el día 14 de Junio sale en España la segunda parte, cosa que me alegró bastante ya que pensé que sólo era un volumen. Mi pregunta es si habrá una tercera entrega o se termina aquí . Un cordial saludo y esperó seguir disfrutando con sus magníficos libros. Buenas tardes desde España. Después de leer la primera entrega de Espartaco, la cual me ha parecido muy buena, quisiera saber si la segunda entrega que aparecerá aquí en España en Junio será la última de esta serie o habrá una tercera como en las otras trilogías suyas?. Muchas gracias por los buenos momentos que he pasado leyendo sus novelas y un cordial saludo. Espero su respuesta. Me encantó el primer libro estoy esperando que llegue a Montevideo esta segunda parte, no puedo esperar 🙁 , ¿Llegará dentro de poco? Hey ben saludos, te felicito por esta serie de libros que nos sumergen en el pasado, abarcando la historia de los grandes héroes de la humanidad, has formado muy buenas historias las cuales nos llevan a un mundo aun desconocido para muchos. @mzotelo: Muchisimas gracias por tu mensaje, y tus palabras amables! Saludos a ti. Just finished part 2 of Spartacus. Enjoyed the 2 books immensely. Brilliant writing, so atmospheric. I was totally in there with Spartacus et al! Well done. Now starting the Hannibal series. @ladyisland: Thanks a lot for taking the time to post a comment. I’m delighted that liked them so much – I really enjoyed writing them. I hope you like the Hannibal books too. Best wishes – Ben.